vacation or an extended stay, here are a few parks which are sure to give you the outdoor fix you need to balance out your urban adventure. Though it’s kind of off the beaten path from the towering hotels of Puerto Madero and the posh shopping and restaurants of Palermo Soho, this park is a hit with local residents. The park is gated and miraculously clean, partly because of a dog ban enforced by the city. While there are no athletic fields, it’s a great place to catch some rays and lay out in the lush green grass. Fun Fact: The Electronics Feria. This is a daily outdoor market of bootleg movies, MP3 cds, video games, and various computer programs. If you have a moral obligation to copyright infringement, stay away. The average cost per disc is $5 pesos, no questions asked. In the heart and hustle of Palermo, the Jardin Botanico truly exemplifies a quality man-made urban escape. Winding paths lead you through lush imported palms and local flora. The paths are quiet, yet safe, and once you’ve immersed yourself in the center of the park, it is quiet enough to forget you’re in the city. The park is also a great place to bring kids. There’s a well-maintained giant playground in the park’s center. The botanical greenhouses themselves seem a bit inaccessible; however, the greenhouse structures themselves have a vintage, somewhat gothic appeal. Fun Fact: This park is considered one of the best make-out spots in all of Buenos Aires. It’s not unusual to see up to 20-30 young Argentine couples locking lips along the secluded paths and shaded lawns. If you’re not into PDA, stick to the playground. The Bosques de Palermo has two sides to it: day and night. 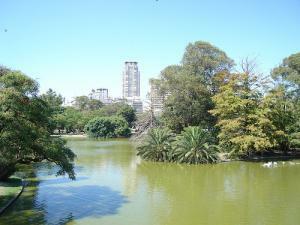 During the day, the park is one of Buenos Aires’ largest and most active parks. Joggers, rollerbladers and bicyclists compete for space with the walkers and those that prefer to mosey. Lounging sunbathers and families with the kids and a picnic blanket soak up rays. A small lake in the center of the park is picturesque and offers the opportunity for paddling lazily in a rowboat. A busy Sunday morning feria, or outdoor market completes the scene. Fun Fact: This park is locally known for being the largest Transvestite prostitute meeting place in the city, after dark. As local legend has it, the residents of the neighborhood tired of the prostitution on streets a few years back and sought a solution. Rather than tirelessly arresting and patrolling, the police allowed the park to become the unofficial meeting point between the ladies and their customers. One of Buenos Aires’ newly refurbished parks, Parque Centenario is graffiti free, dog free, and safe. It’s located in Caballito, a quiet, residential area which is considered to be the geographical center of the city. Like most parks, there’s a large Sunday feria and ample green space for athletics. There’s an amphitheater which holds free concerts in the summer, and a shallow lake with ducks, geese, and fish in the center. Fun Fact: The blocks surrounding the park are home to The National Science Museum of Argentina, The Leloir Institute for scientific research, and the Marie Curie Cancer Hospital. 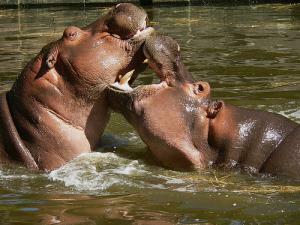 This 45-acre zoo lies adjacent to the Jardin Botanico in Palermo near Plaza Italia. The zoo is a popular attraction for families and young portenos and its convenient location and cheap admission ($8 pesos, $2.60 USD) makes it an easy half-day trip. Aside from the usual animal suspects, this zoo boasts an albino tiger, a petting zoo, and a seal show, as well as other rare and endangered animals which make appearances from time to time. The monkeys seem to be a big hit with the kids, and there’s plenty of space between pens so it’s not overwhelming while walking around. Fun Fact: There are miniature horses to take pictures with outside of the zoo gate. They are typically decorated in elaborate costumes and wear sombreros. 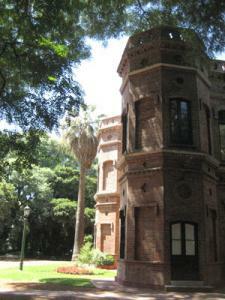 Parque Chacabuco is one of Buenos Aires’ most underrated, largest neighborhood parks. Located next to the barrio of Caballito, in a neighborhood that shares the same name, the park spans a good portion of property in the area. This is a true “barrio,” or neighborhood park. It’s a popular place for local family picnics, Carnival festivals, and dog walkers. There is also ample athletic space as well, so don’t be surprised if you see a soccer match, joggers, and even yoga and tai chi exercises. On a recent night the full moon was visible through a stand of trees that recently bloomed—the park might be most beautiful at dusk. A smaller garden with roses and blooming bushes is gated off within the park and opened on the weekends. It’s worth a trip through. Fun Fact: If you walk about 2 blocks from the northwest corner of the park, you can access the neighborhood public pool. The pool is Olympic sized with Olympic-style diving platforms, and it costs $3 pesos for a day pass. 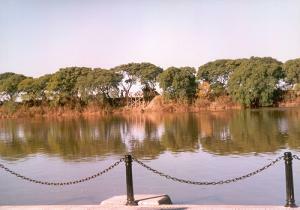 Once an urban landfill, the city’s ecological reserve is one of the wildest and most natural parts of Buenos Aires. The reserve is home to hundreds of different bird species and fauna, due to its status as wetlands. This expansive park has trails and open spaces for joggers, walkers and bikers. Bikes can be rented along the Costanera, bring an identification. The park can be easily accessed by foot from any of the bridges in Puerto Madero, and is a lovely place for a picnic, jog, or just some quiet time. On weekends the park is often crowded with portenos seeking some nature but during the week, it’s fairly empty. It’s a great place to bring the mate, a blanket and some snacks to spend a day pretending you are at the beach. Fun Fact: Along the Costanera, outside of the reserve, there are dozens of portable parillas (grills). These joints are a great place for a cheap snack, serving up burgers, choripan (sausage sandwiches), and steak sandwiches. The prices range from $0.80 USD to $2.00 USD. This page rendered in 0.011 seconds.